The industry broadly recognizes, and is intent on unleashing, the inherent performance potential of NVMeTM flash storage in the datacenter storage hierarchy. NVMe has now become part of the mainstream market for faster storage, with server vendors generally supporting NVMe technologies today and 19 or more storage vendors planning and deploying dedicated or hybrid NVMe-based and NVMe over Fabrics solutions. NVMe over Fabrics has the promise of unleashing the potential performance of NVMe drives in a scalable manner by leveraging the capabilities of mainstream high-performance interconnects. The NVM Express Management Interface specification allows an interoperable management architecture to support IT managers’ ability to extensively administer PCIe SSDs. NVM Express, Inc., the standards body behind the NVMe™ specification library, recently announced the addition of NVMe™ over TCP (NVMe™/TCP) to the family of NVMe transports. NVMe/TCP defines the mapping of NVMe queues, NVMe™ over Fabrics (NVMe-oF™) capsules and data delivery over the IETF Transport Control Protocol (TCP). This webcast will tour the important benefits and features of the new NVMe/TCP specification and dive into the details of this new NVMe transport. Items covered include the wire protocol and optional features such as inline data integrity and transport security. Audience members will gain an technical understanding of the new specification that will help developers seamlessly implement NVMe/TCP in their NVMe-oF solutions. Sagi Grimberg is Chief SW Architect and Co-founder at Lightbits and the lead author of the NVMe/TCP specification. Peter Onufyrk is a Fellow in the Data Center Solutions business unit at Microsemi, an NVMe Board Member, and NVMe-MI Workgroup Chair. NVM Express® over PCI Express® SSDs is the mainstream solution in the client space because it is low cost and has a smaller form factor than HDDs, while touting high performance and low power usage. Evolving to meet the needs of consumers, NVMe™ implementations touch various markets like gaming, content creation, workstations, mobile, media creation and more. Join Jonmichael Hands of Intel and Cameron Brett of Toshiba for this NVM Express, Inc. hosted webcast to learn more about real-world examples and how NVMe specifications continue to evolve to support client needs. In this webcast, attendees will learn more about the benefits of selecting NVMe enabled products like Intel SSDs and Toshiba SSDs. The webcast explores the client benefits that have surfaced with the different iterations of the NVMe specifications from NVMe 1.2 to NVMe 1.3 to the upcoming NVMe 1.4. Attendees will receive an in-depth overview of critical NVMe features including easier management of power/thermals, NVMe’s enablement in small form factors like M.2 and BGA, boot partitions and host controlled thermal management and namespace write protection. Cameron Brett is Director of Marketing, SSD and Storage Solutions, Toshiba Memory America, Inc. and a member of the NVMe Marketing Workgroup. Jonmichael Hands is a Product Marketing Manager at Intel and the NVMe Marketing Workgroup Co-Chair. NVM Express is an open collection of standards and information to expose the full benefits of non-volatile memory in all types of computing environments from mobile to data center. In order for products to function in the real world, they must first go through extensive conformance and interoperability tests. The next NVM Express, Inc. hosted webcast will feature a panel of experts covering the basics of NVMe compliance testing for our suite of specifications. The panelists will also take a deep dive into conformance, interoperability, resilience/error injection testing, and the support infrastructures needed to ensure interoperable supported solutions based on NVM Express® solutions. • Brandon Hoff of Broadcom who will discuss the support for NVMe over Fabrics in production environments. • Tim Sheehan of UNH-IOL who will discuss conformance and interoperability testing at the UNH-IOL. • Mark Jones of FCIA, who will discuss testing and interoperability of FC-NVMe. NVMe™ over Fabrics (NVMe-oF™) is the defacto standard for extending the NVMe™ architecture in a scalable manner over mainstream interconnects. In this NVM Express, Inc. hosted webinar, Brandon Hoff, Distinguished Software Architect at Broadcom and NVMe Marketing Group Member, will provide an update on how NVMe-oF technology has evolved in 2018 and what the future holds in 2019 and beyond. The webcast will cover the transports for NVMe-oF, NVMe-of Enterprise Arrays, NVMe-oF Appliances, and NVMe-oF JBOFs as well as interoperability testing. Viewers will also learn about different NVMe-oF solutions and how NVMe-oF is disrupting the storage landscape and improving the performance of external storage solutions. The momentum around NVMe technology has surpassed expectations and there’s no lull in sight. Developers and other industry enthusiasts are excited about the potential for NVMe in the client/mobile space, as well as in the data center and enterprise. Join us for this NVM Express, Inc.-hosted webcast to learn about the evolution of the NVMe storage protocol and what’s in store for its future, in 2018 and beyond. In this webcast, you will find out more about today’s market adoption, various applications and use cases, as well as the NVMe specifications roadmap, including projected timelines and key enhancements for the NVMe Management Interface 1.1 Specification, the NVM-oF 1.1 Specification and NVMe 1.4 Specification. At the end of this webinar you will have a good understanding of what NVMe-MI is, how it works, and how you can use it in your application. Peter is currently a Fellow in the Performance Solutions Business Unit at Microsemi where he is responsible for NVM controller and PCI Express switch product architecture and validation. Austin Bolen is a member of the Technical Staff at Dell EMC where he has been working as the NVM Express technologist for their PowerEdge server division for the past five years. He is Vice Chair of the NVMe Management Working Group and one of the authors of the NVM Express Management Interface Specification. He is also the Dell EMC representative in the PCI SIG Protocol Working Group which develops the PCI Express Base Specification where a primary object of his is enhancing the PCI Express ecosystem in support of NVMe. Join Brandon Hoff, Distinguished Software Architect at Broadcom, on behalf of NVM Express as he discusses the latest technical developments and benefits of NVMe over Fabrics, market uptake and use cases. See the new and improved features in the NVMe version 1.3 specification. NVM Express hosts Jonmichael Hands of Intel and Co-Chairman of the NVMe Marketing Committee explaining the key changes in the spec. Join to learn the latest in non-volatile memory standards. NVM Express(R) over Fabrics has the promise of unleashing the potential performance of NVMe(TM) drives in a scalable manner by leveraging the capabilities of mainstream high-performance interconnects. There are already several fabrics that have taken the lead in proposed deployments, and others that are being considered. This panel of technologists reviews the benefits of using different fabrics as the platform for this new initiative, and explores how what value they bring to the party for specific applications and workloads. Is one fabric the clear winner, or does the choice depend upon what the end-user is trying to accomplish? NVM Express is becoming the de-facto standard for talking to Non-Volatile Memory over PCI Express. This is, in part, due to the great level of support NVM Express has in modern operating systems. In this webinar we will focus on the support for NVM Express in the Linux operating system. We will show how the NVM Express driver, combined with the Linux Block Layer, enables great performance, low latency and open-source management tools. This talk will focus on how Linux delivers such good performance on NVM Express devices, and discusses some of the roadmap items that are coming to the NVM Express and block layer in Linux. We will also discuss some of the management tools available for NVM Express and Linux today such as the NVMe command line interface tool (nvme-cli). NVM Express was designed from the ground up for solid state drives to deliver high bandwidth and low latency through the PCIe interface with a new streamlined protocol, efficient performance, with industry standard software, drivers, and management. 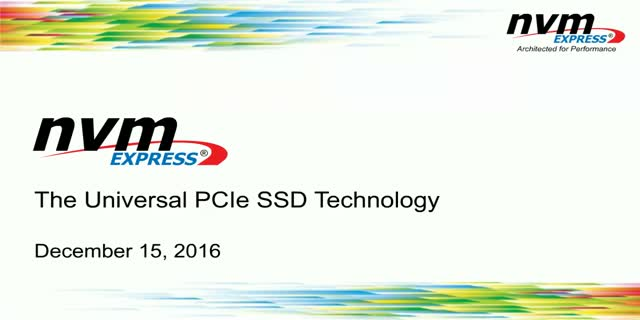 NVM Express is now THE standard for PCIe solid state drives, and it is now making its way into desktop, laptops, and mobile computing. In this webcast, you will learn how NVM Express is removing storage bottlenecks in client computing by driving the transition from the SATA interface and unleashing the full potential for flash storage. NVMe brings high performance and low latency PCIe SSDs into the mainstream with a streamlined protocol that is efficient and scalable, with an ease of deployment through industry standard software and drivers. NVMe is driving changes in cloud computing, software-defined infrastructure, virtualization, HPC, traditional database and big data analytics. See the areas where NVMe can add value to data center applications today through compelling solutions and proof points of real workloads and applications. As NVM Express becomes the de facto interface standard for Enterprise and Client PCIe-based storage, the NVMe specification is evolving to take on the challenge of maintaining low latency to storage media while scaling out to meet the needs of modern data centers and applications. This talk will explore the coming NVMe Over Fabrics specification, and how it enables NVMe to be used across RDMA fabrics (e.g., Ethernet or InfiniBand™ with RDMA, Fibre Channel, etc.) and connect to other NVMe storage devices. Who should attend: engineering and marketing people interested in learning about how NVMe Over Fabrics works and the new types of system architectures enabled by this protocol. While the compute segments are embracing NVMe as the interface standard for Enterprise and Client PCIe-based storage, NVMe/PCIe is not generally thought of as a platform for mobile storage solutions; i.e., handsets. This talk will explore and discuss what features are needed, and in some cases already there, to make NVMe/PCIe a compelling storage solution for mobile handsets, and small, thin computing devices, in general. Who should attend: engineering and marketing people interested in learning about how NVMe/PCIe is suitable for mobile storage solutions. The NVM Express Infrastructure webinar covers how and why to deploy NVMeTM solid-state drives in the data center, and explores available PCI Express SSD topologies, form factors, and interconnects. Learn what it takes to bring high performance PCIe SSDs into the mainstream with NVMe, and discover the value it delivers to the data center with an efficient protocol, the scalability and flexibility of PCIe, and a standard ecosystem for software, drivers, and management.